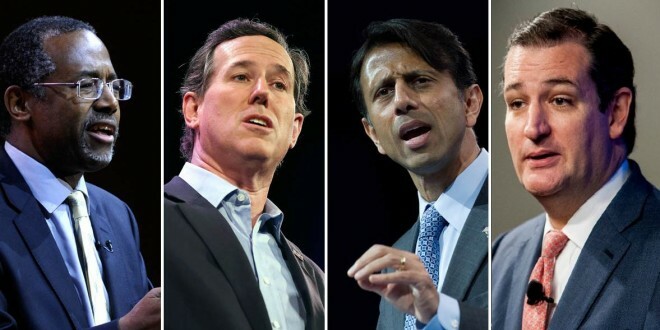 Another NOM Humiliation: Only Four Out Of 17 GOP Presidential Candidates Have Signed Their Hate Pledge - Joe.My.God. Here is the text of the hate pledge. As you can see, it covers a lot more than just marriage. NOM Presidential Pledge: I [insert name of crazy person], pledge to the American people that if elected President, I will: One, support a federal constitutional amendment that protects marriage as the union of one man and one woman. Two, oppose and work to overturn any Supreme Court decision that illegitimately finds a constitutional “right” to the redefinition of marriage. This includes nominating to the U.S. Supreme Court and federal bench judges who are committed to restraint and applying the original meaning of the Constitution, and appointing an attorney general similarly committed. Three, conduct a review of regulatory, administrative and executive actions taken by the current Administration that have the effect of undermining marriage and work to restore our policies to be consistent with the proper understanding of marriage as the union of one man and one woman. Consistent with this, prevent the promotion of a redefined version of marriage in public schools and other government entities. Four, support the First Amendment Defense Act and other legislation that recognizes the right of organizations and individuals to act in the public square consistent with their belief that marriage is the union of one man and one woman without fear of retaliation from the government. Five, direct the Department of Justice to investigate, document and publicize cases of Americans who have been harassed or threatened for exercising key civil rights to organize, to speak, to donate or to vote for marriage and to propose new protections, if needed.